With almost all the ballots counted, results from the Greek referendum show voters decisively rejecting the terms of an international bailout. Figures published by the interior ministry showed nearly 62% of those whose ballots had been counted voting "No", against 38% voting "Yes". Greece's governing Syriza party had campaigned for a "No", saying the bailout terms were humiliating. Their opponents warned that this could see Greece ejected from the eurozone. "Today we celebrate the victory of democracy, but tomorrow all together we continue and complete a national effort for exiting this crisis," Greek Prime Minister Alexis Tsipras said in a televised address. He said that voters had granted him "not a mandate against Europe, but a mandate to find a sustainable solution that will take us out of this vicious circle of austerity". Some European officials had said that a "No" would be seen as an outright rejection of talks with creditors. But Greek government officials have insisted that rejecting bailout terms would strengthen their hand, and that they could rapidly strike a deal for fresh funding in resumed negotiations. Greek banks would reopen by Tuesday, they said. Reacting to the result of Sunday's vote, Greek Finance Minister Yanis Varoufakis called it "a big 'yes' to a democratic Europe". Greece would enter into "positive" in negotiations with its creditors, he said. Euclid Tsakalotos, Greece's deputy foreign minister, told Star TV that two developments would allow Greece to pursue "a solution that is financially viable". "Firstly, the government now has a new popular mandate and the second is the latest [International Monetary Fund] report which says that the Greek debt is unsustainable." 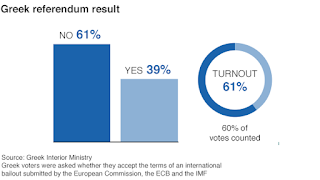 Greece had been locked in negotiations with its creditors for months when the Greek government unexpectedly called a referendum on the terms it was being offered. Banks have been shut and capital controls in place since last Monday, after the European Central Bank declined to give Greece more emergency funding. Withdrawals at cash machines have been limited to €60 per day. 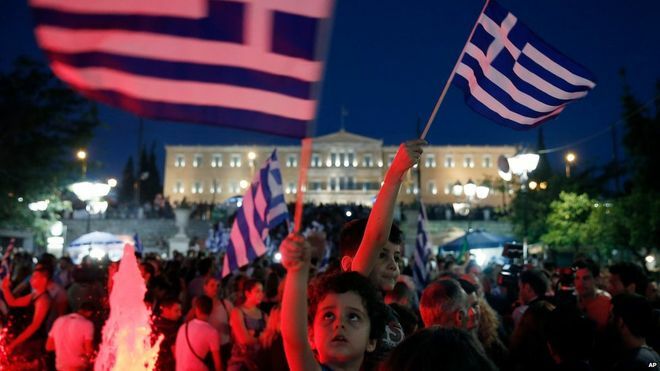 Greece's latest bailout expired on Tuesday and Greece missed a €1.6bn (£1.1bn) payment to the IMF.